They say that things are bigger when they come from Texas. And the Rio Red Grapefruit is certainly no exception when it comes down to taste! Having originated in Texas, there is no missing the deep red color and BIG grapefruit flavor of the Rio Red. The trees like high summer heat, which is necessary to produce high-quality fruit. The fruit tends to be large-ish, with a slightly pebbled surface. The outside rind frequently has a pink blush, but is never "bashful" in taste. The Rio Red has a mid to late-season maturity time table. 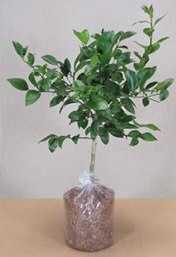 So, if you are looking to grow your own grapefruit tree, why not the "Rio Red"? The dwarf grapefruit tree with flavor the size of Texas!